Yandex shares ad placement revenue with Advertising Network participants. Depending on which advertising product you place on your resource, you will get paid either for ad clicks or for ad impressions. The remuneration procedure and payment amount are set in the agreement. Remuneration begins to accumulate only after the agreement is finalized. Depending on the information provided during registration, the country of residence (Russia/Belarus/other countries) and the type of collaboration (individual/legal entity/individual entrepreneur), the partner either receives a template contract for signing, or accepts Yandex Advertising Network's terms and conditions. The status of your ad platform will change to “In operation” only after your site has passed moderation, the agreement is finalized or the terms are accepted, the documents are sent to Yandex, and the ad blocks are correctly inserted on the website pages. The same is true for apps and video resources. Tracking of impressions and referrals will begin at this time. Remuneration is awarded on the terms and in the amounts stipulated in the agreement. A partner can only get remuneration when the amount of revenue reaches a certain threshold. This threshold depends on the form of collaboration and the partner's country of residence. If you reach this amount in the current month, it will be paid within 20 business days of the following month. If you don't reach this amount in the current month, your revenue for this month will be combined with the revenue for the following months until the threshold is reached. Then it will be paid within 20 business days of the following month. Calculations are made based on data from the Yandex Statistics Accounting System. You can check out our statistical reports in the partner interface. For individuals — Yandex holds and pays tax on the personal income of residents of the Russian Federation from the accrued remuneration (13%), and also pays the insurance premiums to the state off-budget funds. In all other cases, the necessary taxes and fees will be paid by the partners themselves. The table below shows a comparison of taxes for individuals and individual entrepreneurs (who are on a simplified taxation system, without employees). Tax rates and other information are relevant to June 2014. 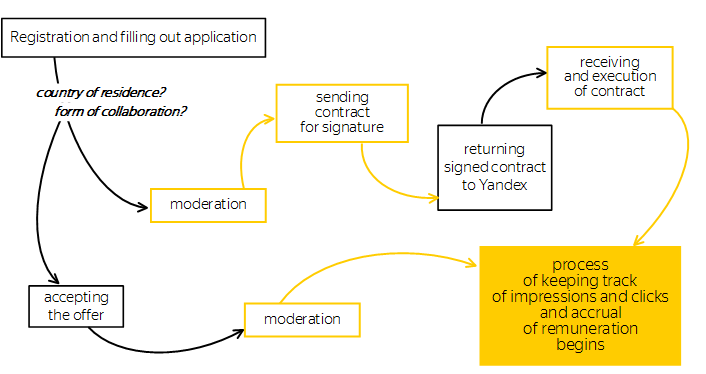 Yandex acts as a tax agent (Section 1, Article 226 of the Tax Code of the Russian Federation). From the partner's remuneration, the company withholds tax to the rate of 13% (Personal Income Tax) and transfers it to the budget. In this case, the partner does not need to pay income tax. Taxes also do not need to be declared, since Yandex keeps a record of payments and reports them to the tax authorities (Section 1, Article 230 of the Tax Code of the Russian Federation). If necessary, the company provides partners with a 2-NDFL personal income tax form with information detailing the amount of remuneration paid and tax withheld. Keep income records from Yandex (Article 346.24 of the Tax Code of the Russian Federation). Calculate and pay taxes quarterly at the rate of 6% of the income received from Yandex (Section 1, Article 346.20 of the Tax Code of the Russian Federation). Annually file a tax declaration (Subparagraph 2 Section 1, 346.23 of the Tax Code of the Russian Federation). The partner's tax is reduced by the amount of insurance premiums paid in a “fixed amount” (all insurance premiums actually accrued within the period of the past year). Before paying final taxes, check the position of the Russian Ministry of Finance on this issue as of the end of the year. Yandex pays the insurance premiums of the partner from their own funds. The partner must calculate and pay the insurance premiums themselves. If the annual revenue does not exceed 300 thousand rubles, then the amount of insurance premiums will be approximately 20,700 rubles. If the annual revenue exceeds 300 thousand rubles, then an additional 1% is paid on the excess amount. The maximum amount to pay is about 138,600 rubles per year (Section 1, Article 14 of The law of the Russian Federation from 24.07.2009 N 212-FZ). The time and financial costs of registration, calculation, declaration and payment of taxes and insurance premiums, as well as monitoring changes in tax legislation. Yandex is responsible for the partner's accounting of revenue, calculation, declaration and payment of taxes and insurance premiums of the partner. If the monetization of site traffic is your main source of income, we recommend that you keep track of jurisprudence on the imposition of penalties for such activities without being registered as an individual entrepreneur (Article 116 of the Tax Code of the Russian Federation, Article 171 of the Criminal Code of the Russian Federation). The partner is responsible for registering as an individual entrepreneur, as well as keeping income records, and the declaration and payment of taxes and insurance premiums.